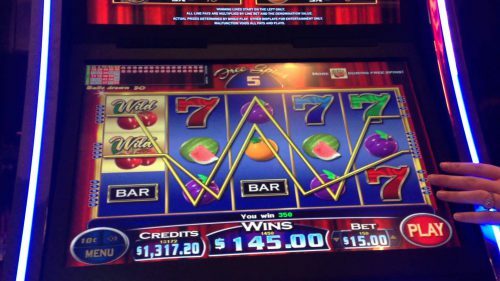 I don’t know what it is about fruit themed video slots, but us casino players just don’t get tired of it. 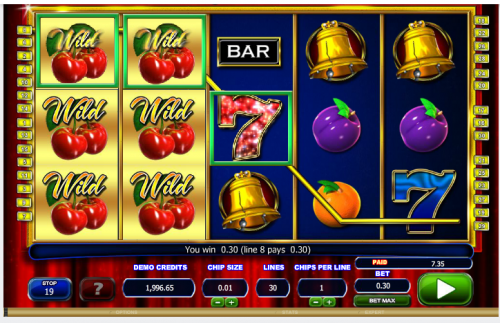 Although the Cherries Gone Wild slot is a fruit themed slot, it has its fair share of surprise features. Contrary to its title the Cherries Gone Wild slot doesn’t only have cherries on the reels. There are watermelons and bell symbols too. Additionally there are some classic symbols like numbers. The reels backdrop makes you feel a little like your in an old-school movie theatre. This is a very basic slot, easy to understand. Just pay a little extra attention to placing bets because the options are more advanced than usual. There are 5 reels and 30 paylines on this slot. It’s up to you to decide how many paylines you want to activate. On the reels you’ll find classic symbols like the lucky 7, but what you’re really interested in is the more valuable symbols. It’s easy to recognize the wild symbol, it’s a picture of cherries with ‘Cherries Gone Wild’ written on it. The Scatter is represented by a start shaped symbol. Get three or more on the reels and you’re entitled to the spins. Try this slot for free first to try out the value of different combinations and learn the tricks of the game. This cool video slot is made by Microgaming, probably the one developer with the most iconic video slots to its name. For example the progressive slots Mega Moolah and Cleopatra. Cherries Gone Wild on the other hand is a more low-key, low-stake kind of slot. But that is also what makes it so easy and accessible to play for everyone. Once the reels are spinning all is clear, just pay a little extra attention to placing your bets. Just below the reels at the bottom of your screen you can choose your chip size and chips per line. The minimum per line is 1 coin, the maximum is 20. You can adjust with the arrows beneath the button. For your comfort it’s also possible to set the slot on Autoplay. Or if you’re in a daring mood, go for ‘bet max’. The maximum amount of coins to win is 500 (jackpot).